Clarets stick to their guns over Shackell! Burnley are sticking to their guns amid continued interest in captain Jason Shackell. Derby County have tried desperately to prise their former skipper away from Turf Moor this summer. But I understand the Clarets have now rebuffed at least three offers for the 32-year-old – the last of which came in in the region of £3m. Eddie Howe signed Shackell in 2012 from Derby for £1.1m, and he has only missed two league games in three seasons, making 136 appearances in total, scoring four goals, including two against Blackburn Rovers. 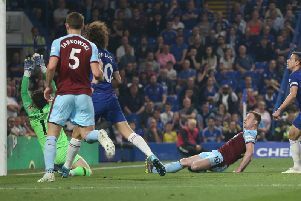 He was one of Burnley’s most consistent performers in the Premier League, at one stage statistically rated the third best performing defender in the top flight, and 15th of all defenders in European football’s top five leagues. No surprise then that the Clarets are keen to hold onto the Stevenage-born defender, who has a year remaining on his contract. Sean Dyche clearly outlined Burnley’s stance last month, following the departures of Danny Ings and Kieran Trippier, insisting there would be no exodus: “Everyone is under contract. “We’re in a way different position than we were two and a half years ago, and there’ll be no point teams bidding for our players – it will be us that decides who goes out. “It won’t be a case of clubs bidding and they just go. “We’re too powerful now in the market. Derby have paid no heed to that warning, but have been so far frustrated in their efforts to land Shackell. Their initial offer was for £1.5m, rising potentially to £2m, and their subsequent bids have now pushed the £3m mark. However, the Rams have been knocked back each time, and it remains to be seen if they will up the ante for a player who is 32 in September. Shackell sat out last Friday’s 2-1 win over Etoile Carouge in Geneva – Burnley’s first pre-season friendly – with what was reported as a “calf problem”, but is in line to feature at Accrington Stanley on Saturday. Would you cash in on Jason Shackell or hold on to him?